A few months ago I had a similiar "Chess" and Rabbi Shamai Gross passeled it Because the left "Zayin" is shaped like a "Nun" which makes it a "Tof". 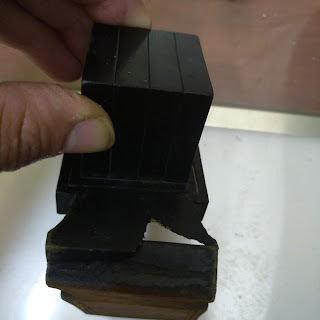 Recently, When I was checking this guy's Tefillin I noticed a similiar "Chess" and I brought it to Rabbi Wosner in Montreal (the author of Shu"t Chayei Halevi, nephew of Shevet Halevi) and he said after much thought "S'is gornisht"
Here's a copy of Tefillin which are Meyuchas to R' Reuven Sofer, the source of Ksav Chabad. Notice the "Chess". 1) The ches in the first picture is much more of a blita than the photocopy of reb ruvain. 2) If it was a ches d'rashi it would without doubt be possul as it would be a kosher tof. 3) If it would be a zayin with a blitta like that on the regel it would be a very difficult shailah,worse than the ches, at it could be considered a kosher nun (kfufa). 4) These parshiyos look like they were written by a famous Montreal sofer called Silverman (Z"L). 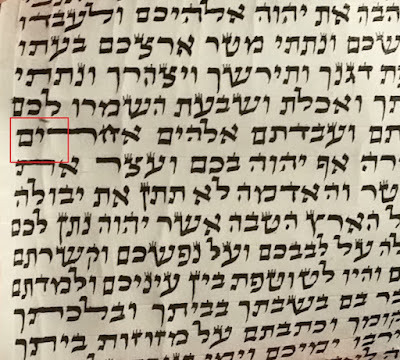 He didn't really write ksav Chabad, more like a blend of pre-war style arizal which ahs many similarities to ksav chabad, however I will admit that the blitos on the regel of ches and zayin is a problem today only in ksav chabad as post was arizal and beis yosef do not have such a regel. However I have seen this issue plenty in pre war arizal and beis yosef sifrei torah. There is a sefer called Ksav Chabad, which in it brings a Haarea from Rabbi Yosef Belinov p.74-5 commenting on the common ח problem. He explains that if there is a small bend of the Tachtis Haregel going left, this creates the problem. Therefore one should be particular on the bottom Shpitz of the Regel that it should go straight down and not bend at all to the left. This is the difference between the first (not good) and second picture. By the way, what is a good Sefer for Makom Kvias HaMezuzah (preferably with pictures)? The best compendium I have found on makom kevias hamezuzah and many other related issues is פתחי שערים by HaRav Aharon Shechter and HaRav Uri Oyerbach. It has many pictures and is thorough with mekorot, case examples and piskei halacha lemaasei. Last I checked it's readily available from good sefarim stores (in israel but I'm sure in chu"l as well). General question on the Cheis situation. 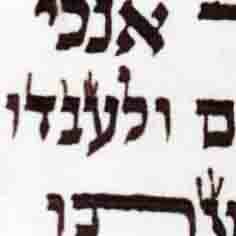 Can we rely on the Chatotros (of the cheis) to be machshir even if its regel did extend a little bit towards the left?